A gift from the same friend that gave me the last Star Trek beer I tried, this is also from the same brewery. That one wasn't the best, but I have hopes that hops will make this one much better. 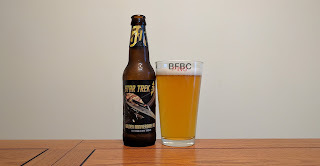 Star Trek should certainly be picky about how good the beer is that they put their name on, but they've put their name on some pretty shoddy stuff before, so I don't know. The beer is definitely golden. The head is dense and sticky enough to make me think that it may deserve the name of "ale." It's not patchy like an IPA, but it has possibilities. The aroma is more spices that have a right to be here; the bready malt is a lot more forward than I'd expect from an ale. Honestly, this is probably the best label of all of the Wiseacre beers so far. This has a wacky couple of angels and... I don't know, leaves and stuff? I'm sure it looked better before it was applied to a bottle, but the curve of the bottle distorts it a bit and makes it pretty hard to read. But, like the others, this is not for reading - it's for drinking. The deep mahogany-hued beer sports a head that fizzles to a bashful ring around the sides of the glass. The aroma is unusual spices on top of heavy malt. The nose gets some dark fruits and raisins behind the rest, and it is clear that this dark beverage has hidden depths. First sip confirms those depths, as I can taste nuts, those dark fruits, oak, and quite a bit of other deliciousness. The heaviness and depth of the beer is very nice, and it's exactly what I would expect from a dubbel. But what should I expect from a swig? 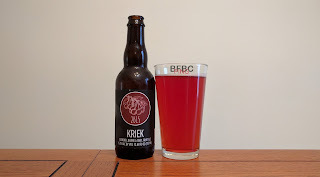 This is a kind of beer that has sour cherries that compliment the rest of the beverage. I am told that hipsters enjoy the sour beers, and this may be targeted at them. If so, I may not like it. I certainly hope that the style, which traces its roots to the Belgians, has enough staying power that even I might enjoy it. The raspberry colored beverage was captured in the picture with a bit of a head, but it was a head very similar to one you'd find on a soda or a wine cooler. As a result, it is ephemeral and disappears very quickly. The aroma is very light, but it has berries and flowers. First sip is sour, sour, sour, and a bit of sour. I'm not a fan of sour beers, but I like sour candies (or I did like 20 years ago when I ate candy), so this has to walk a line between them. It doesn't. Instead, it's just overpowering sour on top of what might be a good beverage, but I may never know, as the sour is just way too much. A swig? That's how I roll. Not the first mead that I've had. The last one was possibly too much of a surprise to me for me to really enjoy it as I should, despite Sloan's tenacious care and expertise. It's possible I just won't like mead, don't like this kind of wine, or am really just a beer guy at heart (which is what I expect). Let's find out. The beverage is honey colored and quite nice looking. There's no head to speak of, as it is a honey wine, there shouldn't be, as I found out the last time I tried one. 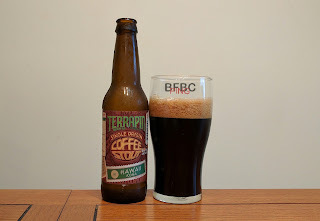 The aroma is once again very wine-like, and I think I've come to appreciate wine (in a limited way) so I can be a bit more objective (although, let's be honest, this blog is about my subjective opinion when you come down to it). The smell is of a very strong wine, indeed. Lots of alcohol happening here (19% ABV). 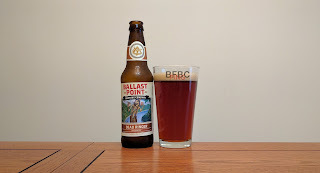 Another Ballast Point beer. 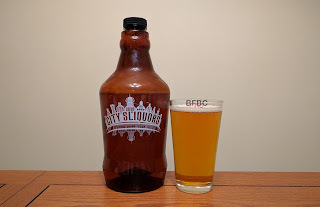 It seems that when I get ahold of a brewer I've never had, I tend to get a few of their beers and try them in sequence. I like to see the direction a brewer is going to see if I want to follow them further. With some, the answer is no. With others, it's HECK YES! 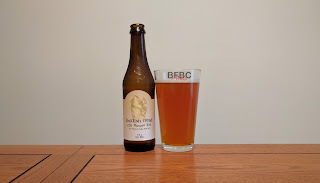 The delightfully golden honey beverage holds up the sticky, sticky head that leaves such lacing on the side that I'm thinking this might actually be an IPA instead of a more pedestrian pale ale (mind you, the label has a subscript of "hoppy pale ale"). The aroma is hoppy, but the hops are musty and a mixture of citrus, pine, and I can even smell a bit of sweet malt there (but I might only be dreaming). Wiseacre continues the series of pretty crappy looking labels. 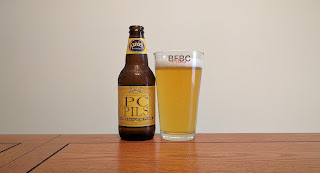 The other two beers showed promise, but they both failed in their own ways. 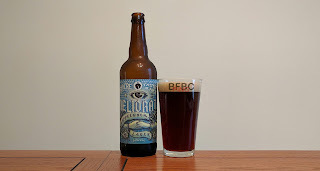 I'm looking for these guys to start brewing truly spectacular beers sometime very soon - in fact, they may already brew the perfect beer, but I haven't had a chance to try it yet. Well, let's see if this is it. The color is a deep red to the point of blackness. The head is pretty minimal, and the very thin cap left after a while is patchy, but it grips the sides well enough. It only grips at the rim, though. There's pretty much no lacing going on at all. The aroma is rich and deep. 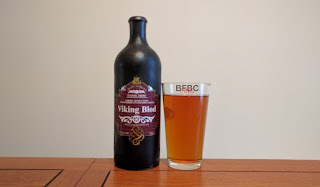 It has dark fruits and sweet malt just bubbling around (I notice quite a bit of sediment swirling around in there when I hold it up to the light).